3.69. Rudna Glava, prehistoric mining site, we ♥ copper & copper ♥ us vol.3: mineralizacija. Video documentation. Majdanpek, Serbia. There is no yet known way to build a smartphone or basically any informations and communication device without turning earths upside down. A zig-zaggy yet continuous line runs from mines to electronic waste, and enormous piles grow by orders of magnitude in dumpsites, especially in Africa and China1. The voices are that the future of mining lies in ‘urban mining’, since astounding amounts of ICT devices are “left to gather dust in the drawers” (Nichols, 2015)2. Between these two extremes—extraction and recycling—of the mineral–ICT supply chain is where the second stage of we ❤ copper & copper ❤ us situates itself. A computer chip contains more than 60 elements, out of 83 stable (nonradioactive) elements (Rohrig, 2015). Supply of the whole periodic table demands tentacular regimes of supply embracing the whole planet, penetrating deep times and inner spaces. 3.70. Flash furnace, Smelter of Mining and Smelting Combine Bor (RTB Bor). mineralizacija. Video documentation. Video: Duško Jelen. 13 January 2016, Bor, Serbia. What is specific about copper is that it does not lose any of its properties through recycling either from raw state or from devices. Copper is meant to last into eternity3. Copper is thus a potential mediator of deep futures in common between humans and the earth. The minerals thirst is however hard to quench, and demand and supply have risen vertiginously over the last 100 years4. As the ore grades generally tend to decline in all mines, ensuring the availability of the metal means digging wider and deeper, but it is thought that ‘peak copper’ will arrive when extraction might become uneconomic. One of the less suspecting places where ICT technologies are materially born is the city of Bor in East Serbia, home to a copper and gold mining and smelting district. In the Bor-Majdanpek mining district, or, geologically speaking, Timok Magmatic Complex, copper lives for about 85 million years. In this region, humans have been crossing paths with the red metal for about 7,000 years. Bor is one of the borderlines where natures and cultures are being cut together and, with much more fierceness, apart, by apparatuses of extractive capitalism. Following #copper #love #maintenance, as part of the same project Frontiers in Retreat, i was invited by KC Grad (Belgrade) to continue work on lives of metals. The organisation, with support from the Ministry of Culture of Serbia, arranged for me to get a chance to visit the operations of Rudarsko-topioničarski basen Bor (RTB Bor, Mining and Smelting Combine Bor). RTB Bor consists of three open-pit mines and one underground exploitation. Escorted by the members of the press team of the company, i was given a unique tour through different stages of production and refining of ore5. Field trips into the industry were supplanted by a crash course in metallurgy through dialogues with Dr. Mile Dimitrijević and Dr. Aleksandra Mitovski of the Technical Faculty in Bor. 3.71. Old slag. Smelter of RTB Bor. Video documentation, mineralizacija. Video: Duško Jelen. 13 January 2016, Bor, Serbia. For the dynamics of the performance it is relevant to understand key steps of mining and metallurgy. One of the places where ore is taken from the ground is Veliki Krivelj, the deepest and widest of the three open-pit operations of RTB Bor. The sheer volume of the hole made by dynamite is beyond visual imagination, the huge trucks carrying 220t of ore each look like tiny ants milling slowly along the terraces spiralling the pit6. I feel like Alice in this mine land. It dawns on me that humans indeed display geologic capacities. No photographs or a geological epoch proposal could have prepared me for the scale of operations that invisibilise earths. After extraction, a series of metallurgical operations are put to work to concentrate elemental particles distributed in the ore. The ore in Bor district contains around 0,3% of copper, whereas the market standard for copper as a delivered commodity is 99,99% pure copper. Enter metallurgists, who perform this magic of converting rock into metal. In the earth’s strata, copper creates two basic types of chemical compounds: oxides and sulphides. In Bor area, copper lives primarily in sulphidic mineralisations, to which are applied pyrometallurgical production processes. After ore has been mined, it is crushed (comminuted) into powder, which is then processed through froth flotation. Pulverised ore is sank into water and a chemical reaction separates a number of elements considered impurities, which sink to the bottom of the pool, while the concentrate of red metal remains in the surface of the pond. The copper concentrate now contains c. 20% of the metal. The remaining material on the bottom of the pool, called gangue, is deposited into tailing ponds7. Comminution and flotation are performed in close proximity of the mine itself, after which copper concentrate is transported by truck to the smelter complex, which is about 10km away, right next to the town centre of Bor. 3.72. Electronic and electric waste recycling factory, mineralizacija. Video documentation. 5 January 2016, Niš, Serbia. 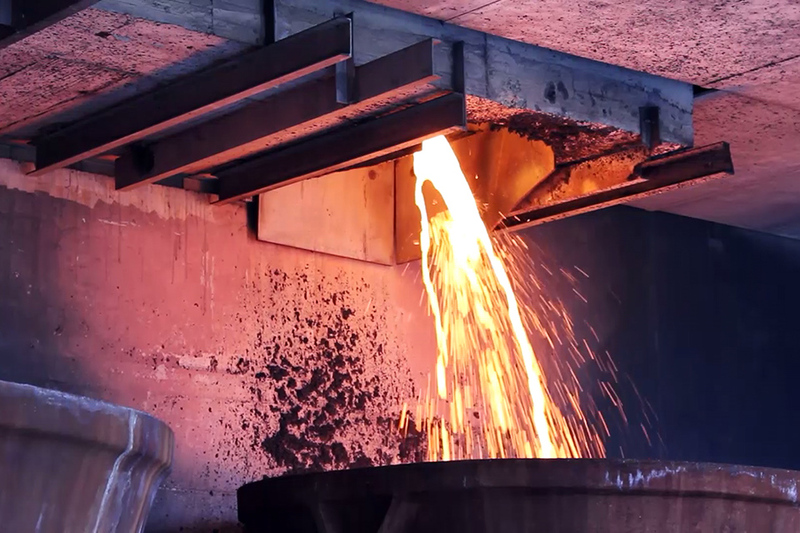 Smelting of sulphide concentrate is a four-step process. Firstly, the ore is roasted producing calcine and sulphur dioxide. Roasted ore is then poured into the flesh furnace, where at temperatures around 1250 degrees (copper melts at 1,085°C), copper separates from sulphides and the outcome is called matte, which now contains 45-75% Cu. The side product is sulphuric acid which is then channelled into the factory of sulphuric acid (and some parts of it find their way out through the chimney). The next step is conversion of matte in a long cylinder furnace, after which is obtained blister copper (98-99% pure). 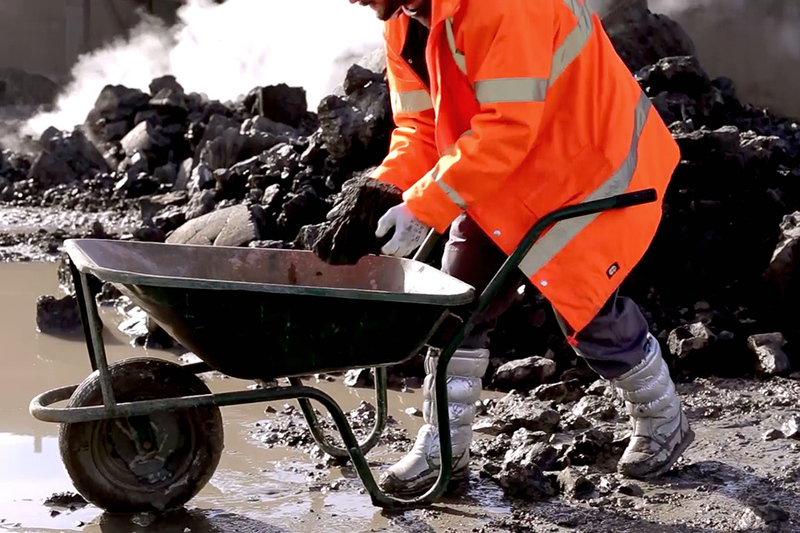 Processes of smelting in the flash furnace produce slag, a lava-like mass that is rich in iron and sulphur oxides, but which also contains traces of copper8. Blister copper is finally molten into anodes, iridescent bars of deep greenish-violetish hues. One last step towards achieving the so-called four-9’s copper is electrorefining, where anodes are immersed into a sulphuric acid solution, in which they dissolve and electrons of copper attracted by tin or copper plates form cathodes, while the remaining impurities, the anode mud, sinks to the bottom of the pool. Copper cathodes are pinkish-orange plates weighing around 100kg each, with less than 0,004% of other elements. They are the prime form in which copper is traded in the world commodities markets. Cathodes can be molten into anything from wires to computer chips. Some of this happens in the cable factory and copper alloys foundry, parts of RTB Bor complex. At Bor it is very hard to lose sight of the mine, its (side-)effects and products. The hills surrounding the old pit are covered or even made of gangue, flatly cut hilltops show this is an industry which literally moves mountains. Light-weight copper wires imply heavy material movements. Another landscape presence is smoke, which tirelessly billows from the chimneys of the smelter. It pours out in different shades of grey, and sometimes drops close to the ground spreading the stingy smell of sulphuric acid, a toxic agent when set loose in the air. The factory and the mines employ 5,000 people out of 34,000 total population, thus goes the local saying: “as long as there is smoke, there will be life in Bor”. In this period the company, which is still publicly owned, one of the last relics of the socialist organisation, is entering a period of major reorganisation due to its big debt9. The smoke can be a deceitful indicator of economy, but is is a clear point of friction with the town inhabitants. Locals are very wary not to end up in the ‘cloud’ or the infamous ‘Bor pudding’10. More peacefully, a number of bronze sculptures are scattered around town, product of artists who came to the now shut Bor Art Colony. Large blocks of ore are exhibited on postaments. The metal holds an undisputed however ambiguous central place in the urban context and collective imagery of the town. 3.73. 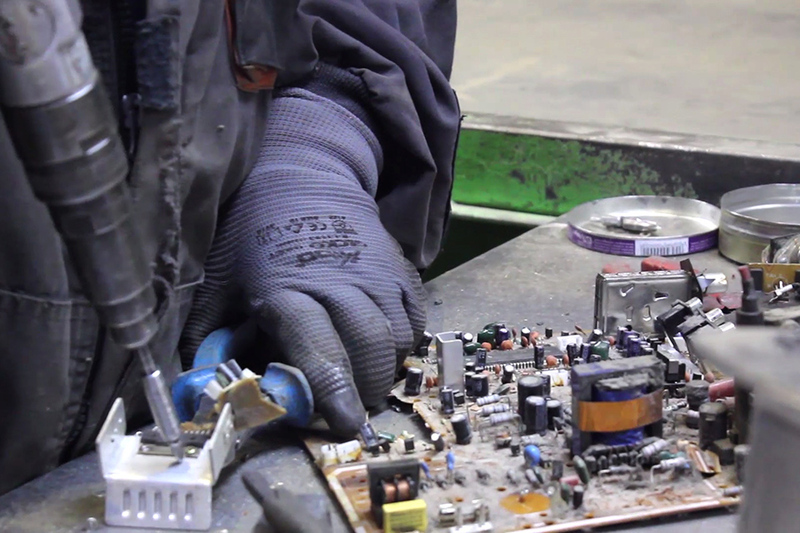 Electronic waste recycling, mineralizacija. Video documentation. Video: Marika Troili. 5 January 2016, Niš, Serbia. The wider region of Timočka krajina, or, geologically, of Timok Magmatic Complex was intermittently mined since prehistoric times. The region around Bor is implicated in much longer metallic histories than those of the current commodity markets fluctuations. Where the big pit of the modern mine gapes, once towered Tilva Roš (“red hill” in Vlachian language11), along the slopes of which Ancient Romans pursued their own copper hunts. The modern mining operation started as a private enterprise in 1903, then changed hands, and became nationalised after World War II. For over two decades, after the end of the socialist Yugoslavia, it is constantly seen as an unsolvable financial problem to the state. This would be a story of the post-industrial post-socialist decline, by-product of development patterns of 20th century capitalisms and socialisms alike, were it not for another twist. The larger Bor area is experiencing a true gold rush, led by Rakita, a joint venture of multinationals Canada-based Reservoir Minerals and U.S.-based Freeport-McMoran Exploration Corp. Interestingly, the “significant copper-gold high sulphidation and porphyry copper-gold mineralisation” that Rakita discovered is situated merely 5km from the Old Pit of RTB Bor. The presents and futures are close neighbours, and extraction does not retreat where there is smell of copper. In this mountainous peripheral area of South-East Europe is where financial and extractive capitalism unleash their powers, pressing heavily upon human and other-than-human bodies within their reach. Beneath the surfaces, elements conceal memories of Big Bang’s nuclear fissions, and conspire future cracks and crystals12. Is it possible for us humans to meet the earth others halfway? What would these meetings look like, across the radical differences in becoming, mass and force? 3.74. Copper recycled from wires, mineralizacija. Video: Marika Troili. 6 January 2016, Niš, Serbia. During my copper journeys in Finland and Serbia, most striking was an affective and cognitive realisation of the degree of my own boundedness within the webs of technological and capitalist processes. At the prehistoric mine of Rudna Glava, as the sun was setting down, i felt that i am, as most of us, an extractivist subjectivity, a product of long histories of natural-cultural asymmetrical transactions. Subjectivity is the crucial site of ecology, and posthuman justice in most cases means working with and against myself. My stance is anti-extractivist, but over time i understood that, if i am to do artistic work around extraction in the present, it must be a creative critique from up close, embedded in the currently existing processes. I don’t think it is feasible to say that all mining must stop, but what can and must be imagined and commenced are modes of reorienting the dynamics of the industry, not from but for the earth. The creative proposal began by thinking that extraction could be an acceptable practice, but only if it truly entangled with geological processes, that is, if it followed the living dynamics of the earth. 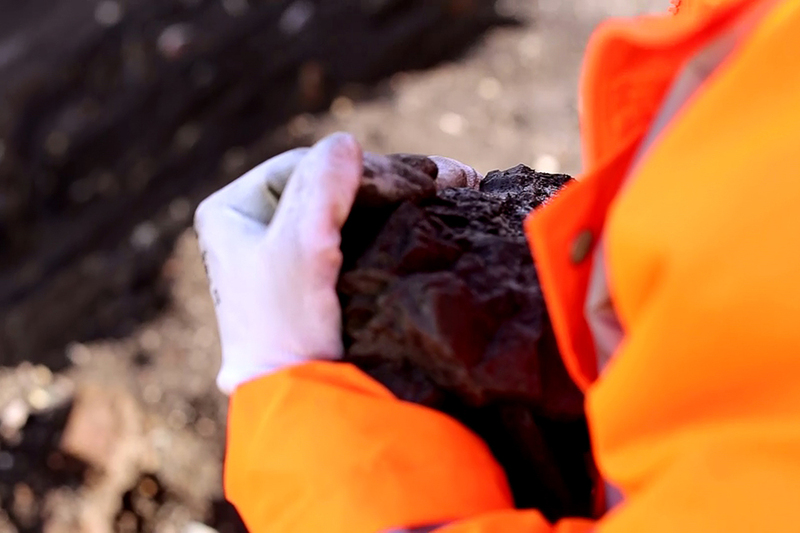 Temporally speaking, what would mining mean if it would be a truly geological process, i.e. if it took place over thousands and millions of years, at the speed of mineralisations? 3.75. Blue stone synthesis performed by Dr Aleksandra Mitovski, mineralizacija. Video documentation. Video: Duško Jelen. 11 January 2016, Technical Faculty in Bor. Upon learning the modalities of work in the mine and the smelter, the preliminary idea of slowing down the actions of labourers resulted impossible to execute materially. The extractive-metallurgical apparatus is too tight and too linear, and most contemprary mining is performed by machines with their own intrinsic velocities. Nevertheless, each apparatus circuitry contains alternative possibilities. While studying flow diagrams of metallurgical processes, it became clear that this apparatus, as most of the others, simply cuts out the earth. So the question became how to traverse through the possibility spacetime of the process to create an opening for the secluded minority, the earth to perform its possibilities of becoming. Copper recycling effectively recirculates copper that is already extracted, but this is too short a process geologically speaking, and it leaves the earth out once again. The question was how to open the loop of this quasi-circular economy, which was still not circular enough. Following Naomi Klein’s injunction to ‘keep in the ground’, with all the mineral matter that is already present above ground, it would be important also to withdraw it from the loops in which it is constrained13. ‘Bring it back in the ground’. At some point, copper should also be afforded to return to the earth, where it would be free to continue its other lives. If after mining would come unmining, if extraction (reaping) would be counterpointed with sowing, depositing into the strata, perhaps mining could start being a reproductive intra-action with the earth. 3.76. Blue stone synthesis by Dr. Aleksandra Mitovski, mineralizacija. Video documentation. Video: Duško Jelen. 11 January 2016, Technical Faculty in Bor. 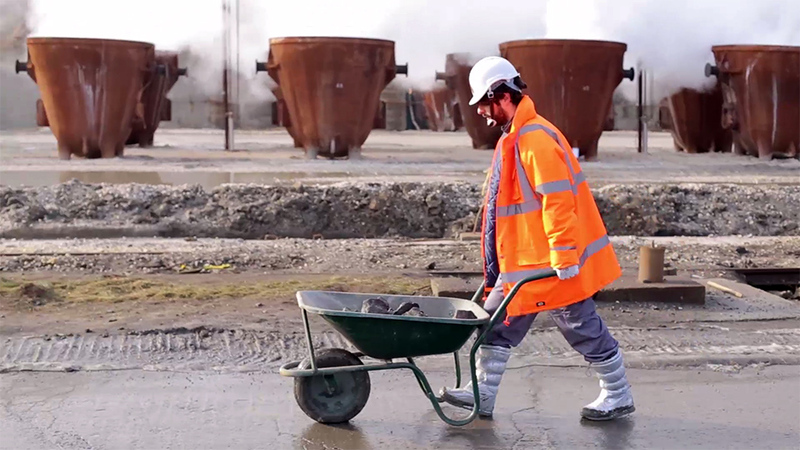 mineralizacija set out to perform a recycling process in reverse, a re-earthing, from pure metal to the state of ore, that will be then deposited/planted in the ground. The aim was to find a way to intermingle with the earth’s imaginative powers, to intra-act with its creativity in a more-than-human economy that is not anymore about mastery but about collaboration over deep futures. Who knows what will take shape in the strata over another 85 million years. The idea of unmining emerged from the conversations with the workers and metallurgists, after which we discussed how this could be done. This is clearly the exact opposite of what mining and metallurgy is about, their mission statement being that of extracting the metal from its dispersed state in the ore. Some of my interlocutors took up the challenge and tried to creatively figure out how we could remake the ore starting from the end product, the wire. During my residency at Bor, and over the months that followed, the score of the performance took shape in collaboration with several institutions and people involved: the mining-smelting complex, the Technical Faculty of Bor, and e-recycling factory E-reciklaža in Niš. Crucial in the score development was the conversation and exchange with Dr. Aleksandra Mitovski of the Technical Faculty at Bor. What follows is an account of the performance that took place in January 2016. Since it span across multiple sites and times, and involved different types of processes, the best way to represent is to tell the story14. 3.77. Blue stone synthesis by Dr. Aleksandra Mitovski, mineralizacija. Video documentation. Video: Duško Jelen. 11 January 2016, Technical Faculty in Bor. E-waste is one of the fastest growing flows of matter in the world not only because of consumption patterns, but because refrigerators, computers, TV sets, smartphones are designed to break down just after the warranty has expired15. Some of these prematurely discarded technical corpses are recycled, and one of the few places in Serbia where this happens is in two facilities of E-reciklaža at Niš, a town in East Serbia some 200 km south from Bor. As i learned there, it is extremely complicated to disassemble e-waste in order to recover the constitutive elements. People work neck to neck with machines, it is a manual-technical labour which neither machines nor humans can perform on their own. A massive multi-component machinery eats refrigerators and churns out differently shaped chunks of aluminium, copper, plastic, etc. The workers sieve through the moving lines of the matter to sort out the small pieces the machine cannot classify. TV sets are entirely disassembled by hand. My hosts allow me to rummage through the heaps of strangely shaped metal chunks of copper recycled from refrigerators. Unmining thus commences with a gesture of mining. 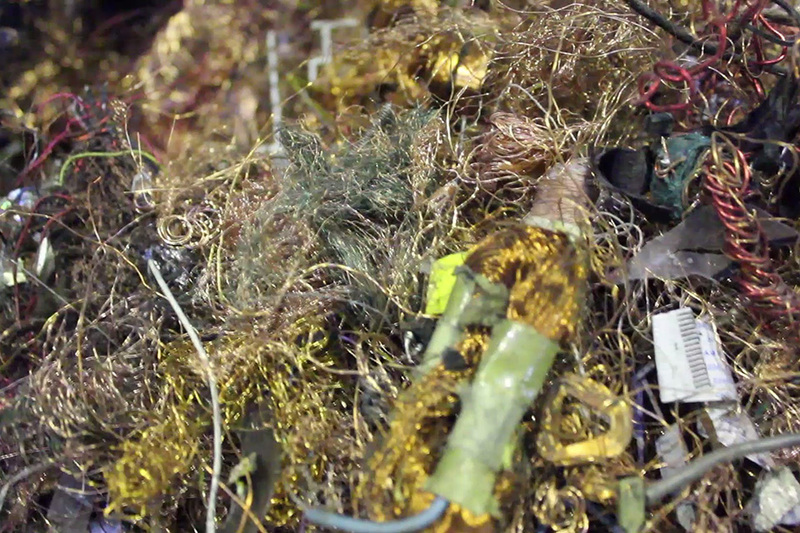 On day 2, we visit the factory where electrical cables are recycled. Wires and cables of all sorts and varieties are fed into machines that shred them into tiny bits, to then separate plastic coating from the metallic core. From the shredders, the copper is usually sent to the foundry where it is moulded into large slabs of high-grade copper which is then sold back to the industry. A special type of foundry output, called ‘copper corn’, attracts me. 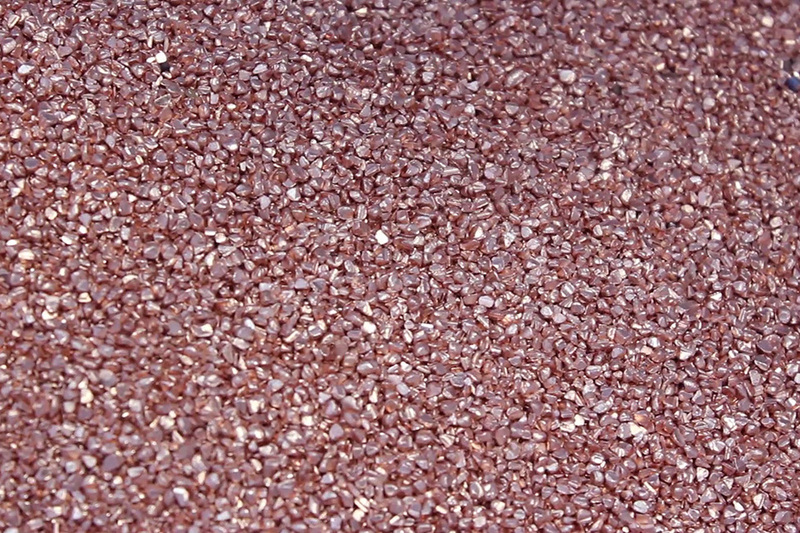 Copper corn is used to industrially produce copper-sulphate (CuSO4), better known as blue stone. Blue stone is a compound used in agriculture as fungicide, revealing a potential material solidarity between copper and plants16. With these ancient characters, now in new (recycled) coats, we jointly set out towards a deep earth future from where it all began. 3.78. Copper(II)-oxide crystallisations, mineralizacija. Video documentatation. Video: Duško Jelen. 12 January 2016, Technical Faculty in Bor. In the laboratories of the Metallurgical department of Technical Faculty of Bor, the recycled copper moves a step closer to its mineral form. 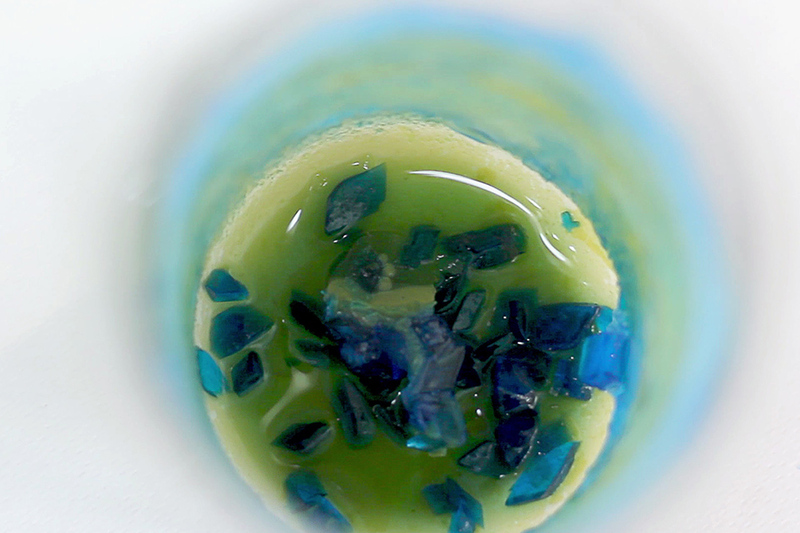 Through a series of (al)chemical transformations, tiny chunks of recycled copper become crystals of copper-sulphate. The choreography of laboratory equipment and particles was orchestrated by Dr Aleksandra Mitovski, and involved Dr Vesna Grekulović17. 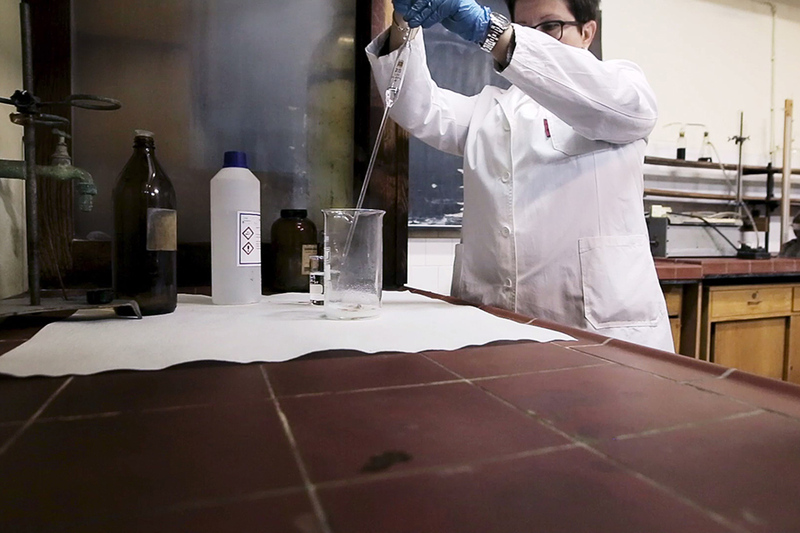 The first step is the dissolution of pieces of copper with the use of sulphuric acid. 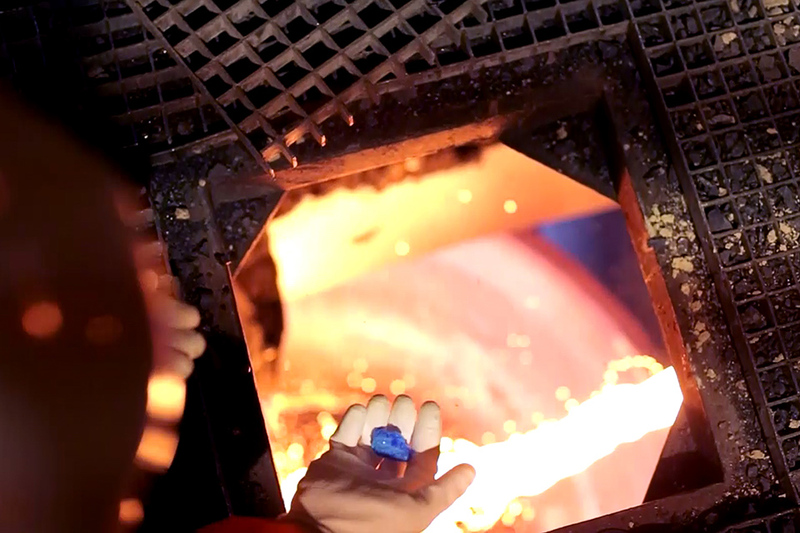 An enriched solution of copper-sulphate, one of the side products of RTB Bor’s smelter, is added to catalyse the crystallisation. The solution is heated up, and upon bringing it to boil, the heat is switched off. As the temperature starts dropping, the crystals begin to form. The slower the temperature decrease, the better pathways crystals will find to assemble together. Tiny centres of crystallisation form at the bottom of the glass. Over days and weeks this blue sand will grow into larger formations by slowly extracting copper particles from the solution. The process can be aided by repeatedly heating up the solution. Crystals are lively beings. From previously solid metals, copper has now become a population of differently shaped and sized individuals, each a unique crystal figure like no other. 3.79. Making crystal-slag, mineralizacija. Video documentation. Video: Duško Jelen. 13 January 2016, Smelter of RTB Bor. 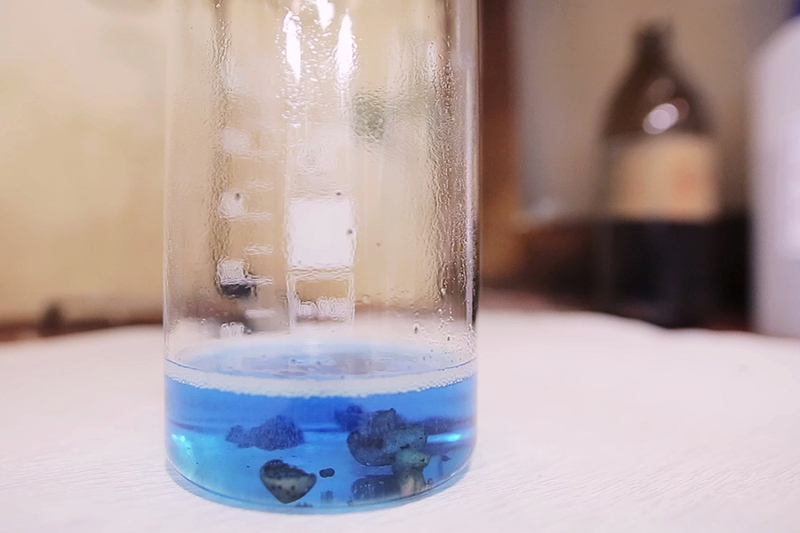 The chemical composition of the ore is about 0,3% of copper, so copper-sulphate needed to become only a tiny fraction in a larger rock mass. In the beginning, i thought it would be enough to throw into a furnace the various elements composing the rock, together with small bits of copper, and that would re-create the rock. However, from the metallurgists i learned that this is materially impossible, because much higher temperature and pressures are needed, an actual volcano to cook a rock. There are no active volcanoes in the region, and staying with the ethos of minor intervention (firing a furnace implies huge dispense of energy), we simply used what is already happening. Flash furnaces at RTB Bor are fed with copper concentrate (processed ore + additives), and the outputs are blister copper and slag. 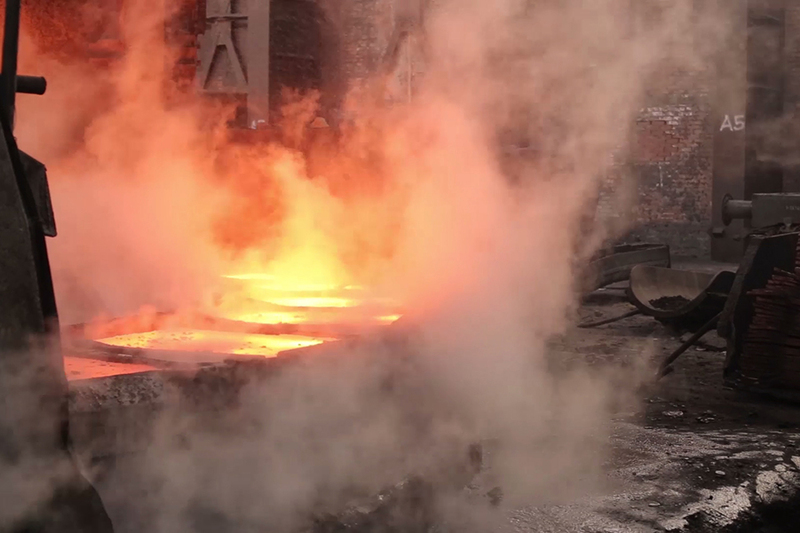 Slag continuously recirculates to the flotation and back to the furnace, it is the key supporting actor in smelting. For this infrastructural characteristic it holds, i imagined that slag would be a possible character that could be spun out and away from the cycle of smelting and flotation. In the room where slag exits from the furnace, the heat is almost unbearable and the sulphuric acid fumes bite the nostrils. Through a hole, slag in magma-like state pours down into iron pots some metres below (fig. 3.79, 3.80). Amidst the workers who suspend their duties for a couple of minutes, i approach the hole with a silver box in my hands. The box contains various bits and pieces of copper that were gathered and crystallised in the journey so far. I slowly send the recycled copper pieces down to join the stream of lava, thus becoming a crystal-enriched slag now (fig. 3.79). At this point, the performance is joining the usual production circuit of slag. 3.80. Slag exiting the furnace, mineralizacija. 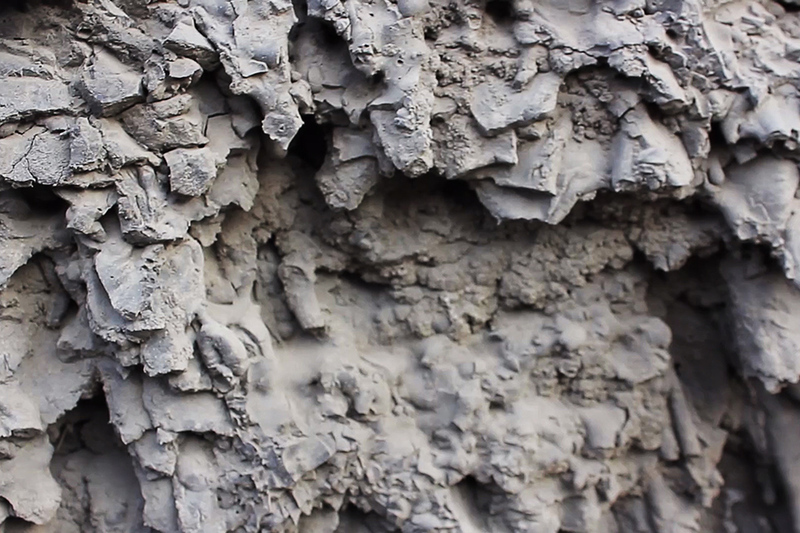 Video documentation, Video: Duško Jelen. 13 January 2016, Smelter of RTB Bor. Massive pots of slag, each containing about 60 tonnes of boiling matter, when they are filled, get trucked to the adjacent clearance, where, lined up in long rows, they are left to stand in open weather to cool down. The process is accelerated by water showers. Most of the water evaporates in touch with the hot matter. Once the slag cools down, usually after two days, the truck lifts the pot with its metallic arms and spills it into a small basin (fig. 3.81). Even after a couple of days of standing outdoors and being showered with water, the slag still emanates fumes in this winter afternoon. The red magma from the furnace has now become rock again. 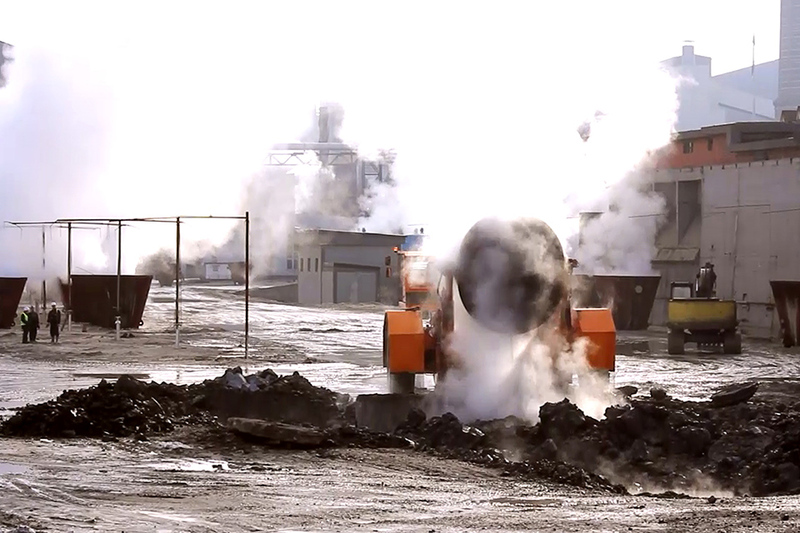 The common procedure at this point is that slag driven to the flotation where copper concentrate is extracted again. However, some parts of this pile will head elsewhere. This is where the minoritarian branching out from the organisational diagram of the smelter takes place. The smelter on one side flanks the city, while on the other it is surrounded by the landscape of extraction. Just next to the smelter lies about 500m deep Old Pit, the void result of mining since it began in 1903 until the 1990s. Now shut, it is the site of a disappeared mountain, a cone turned upside down18. 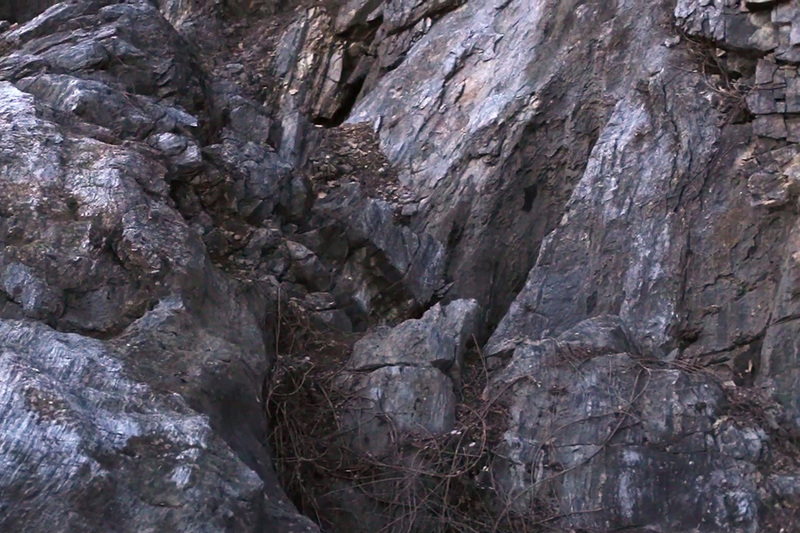 The rocks lying still in the pit below are kins of the freshly cooled down crystal-slag. Some particles of copper may have even come from this very pit, extracted and put into electrical devices. Recycled, recrystallised, remineralised, they are here again. January 2016, Smelter of RTB Bor. Under the gaze of the shift leader of the smelter and several workers, and accompanied by the documentation collaborators Duško and Marika, i approach the pile of unloaded slag pushing a wheelbarrow borrowed from a smelter worker. In line with the safety measures of the complex, i am wearing a worker overalls, an orange fluorescent jacket, and a white helmet. A closer inspection might reveal two copper hearts on the helmet, and the sweater adorned with copper-tape hearts, as well as strange silver boots. I begin placing some of the slag bodies from the fuming pile into the wheelbarrow (fig. 3.82). Some blocks are massive while others are more manageable. At first, i place too many, and can barely life the barrow. The proportions conceal high densities, concentrated powers of chemical becomings. Once i find an agreeable weight, i start pushing the barrow along the plateau where the huge pots of slag are cooling down. On my left side stand the dark formations of old slag, human exercises in stratification of waste. In between these different states of matter, i continue, past the smelter, and onto the old railway tracks. Time ago, a train would go on this very tracks to disgorge the slag into the underlying pit19. The tracks end with a ramp, like in a spaghetti Western film. Upon reaching the barrier, with a sensation of relief, i set the wheelbarrow down. From the collective of slag rocks, i lift one, take a few steps towards the steep edge of the slope, lean and release the rock into the void. I perform this operation for each rock. They roll down and stop when they meet other rocks or gravel. When the barrow is empty, i start walking back the same route, a kilometre or so. I load the wheelbarrow two more times, and take it to other two locations looking down into the Old Pit20. In the last round, i pick one rock only, embrace it and walk it back to the pit (fig. 3.84). Now it is free to become part of the strata again, to concatenate into novel formations with different elements, to mineralise or dissolve into tinier bits. 3.82. Unmining, mineralizacija. Video documentation. Video: Duško Jelen. 13 January 2016, Smelter of RTB Bor. Some 60 km from Bor, on top of the hill above the village of Rudna Glava lies one of the ancient mining sites in Europe. According to the archaeological findings, Rudna Glava was worked for copper by the Vinča culture around 4,500 BCE (Filipović, 2015). Thousands of years ago, these early geological explorers, holding stone tools, followed the greenish marks from the surface down into the earth. They dug until the limit of the lower oxidation zone, around 20 m in depth, to reach the end of the mineral body containing copper minerals malachite, azurite and cuprite (Filipović, 2015: 342). The entrances to the mineshafts are now obstructed, but the marks on the surrounding cliffs indicate strata of labour. Here and in other sites around the Middle East and the Balkans, humans first encountered copper. Concurrently with digging, somehow they discovered also the process of smelting, of giving shape to the metal. Human societies would never be the same, the metals would change technology of working the land, of warfare, as well as dramatically reshuffling the social organisation. The ancient godesses of the earth will be joined and sometimes superseded by gods of fire and underground. The miners and metallurgists will assert themselves as a new upper class, in close conjunction with warriors and priests. Contemporary moderns are part of the same techno-social filiation, we are peoples of metal ages. The hill stands in silence as the night pulls in. The electrical lights shine in the valley far below, dogs break the silence. The rocks around the mineshafts have turned green again. Copper lives here (fig. 3.85). 3.83. Unmining, mineralizacija. Video documentation. Video: Duško Jelen. 13 January 2016, Smelter of RTB Bor. The exhibition. Cultural Front GRAD, Belgrade, 19 – 24 January. 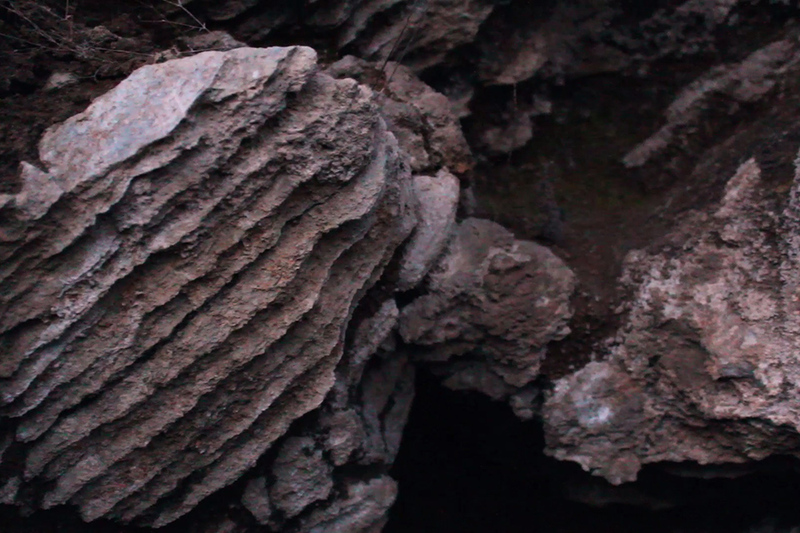 The various steps of the journey/performance of mineralizacija were documented in sound and video by Marika Troili, Duško Jelen and myself. Throughout the research and mineralizacija, i kept a diary that became a poem postajanje-zemlja (becoming-earth) [Appendix I] combining my insights, technical and scientific data and statements about mining and metallurgy. Audio-visual artist Tuomas A. Laitinen produced the musical composition copper drone by mixing together electrical synthesiser sounds with our field recordings. The exhibition at GRAD (Belgrade, January 19-24) documented the on-site performance through an inter-media assembly. The central piece was an installation on pink yoga mats presented all the various states of copper, from old electrical devices, via waste, recycled material, copper(II)-sulphate to the crystal-slag. 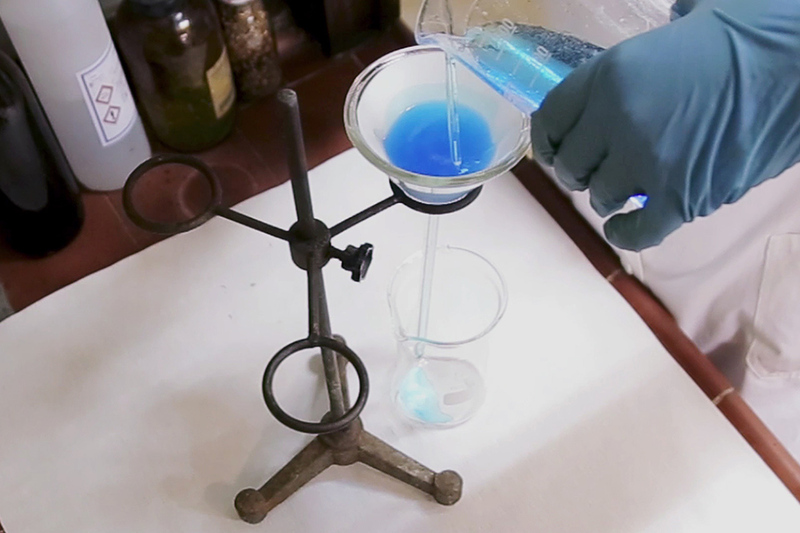 One corner of the installation featured a laboratory set-up with copper(II)-sulphate crystals immersed in solutions. Surrounding the sea of pink were five TV sets showing the video documentation from the various sites and steps of mineralizacija: e-recycling, laboratory, smelter and old pit, Rudna Glava, and the internet (the stock exchange data of trading on the London Metals Exchange, and my online website we heart copper hearts us). The screens were laid horizontally, lifted above ground on yoga blocks, wrapped in different camouflage or pseudo-natural printed textiles. The site-specific mineralizacija was re-enacted or re-narrated for the gallery audience as a performance of postajanje-zemlja on 21 January. Over 75 minutes, i moved between various working stations on the yoga mats: from the ‘scrapyard’ with old computers and phones, to the ‘e-waste disassembly’ table where i unpacked my old iPhone, to the ‘junkyard’, to the ‘lab’, to the pile of slag. By the end of the performance, i made a small mountain of polystyrene hearts. Finally, the rocks and a geological hammer were unmined and deposited into the mountain of hearts. These material-gestural procedures were punctuated by the lines of the poem/diary. The performance unfurled to the droning sounds of Laitinen’s copper drone. The film mineralizacija is an attempt at bringing together some of these disparate media and processes. 3.84. Unmining, mineralizacija. Video documentation. Video: Duško Jelen. 13 January 2016, Smelter of RTB Bor. mineralizacija was an act of mental, social and material re-orientation of the extractivist apparatus towards the great minority of earth. It is a work that proceeded through conversations with workers active in various domains of the industry. The work materialised already there with the question i kept asking, “how can we remake the mineral and deposit it into the mine?” With this utterance, the phase space of the apparatus started shifting a bit. The performative action took place at the heart of the full-scale processes. This implied a change in my own subjective space, becoming partially implicated within the larger apparatus of production, embodying knowings and parameters fully inconceivable before. I have become more of the extractivist subjectivity in order to withdraw through it. Hopefully, some of the persons involved shifted their phase spaces as well. Working with multiple organisations, public and private, especially the massive mining concern, created situations when freedom and autonomy seemed to be waning. The margins of movement were restricted many times, and permissions were given and taken away. However, affinities with insiders helped to pull through it. Many people performed what they usually do, and some performed things they don’t usually do. Knowledges and affects were shared, creating an alternative performative apparatus that moved through the larger one, but with a different disposition. 3.85. Rudna Glava, prehistoric mining site, mineralizacija. Video documentation. Rudna Glava, East Serbia. 14 January 2016, Majdanpek, Serbia. Many times over five months between the first visits and the execution of the performance i was disoriented by the power of agencies in act. Even when i felt overwhelmed if not overpowered, i tried to keep present that the main actor of this story is the earth: victim, audience and collaborator. The whole process was about releasing some of the earth’s agency that has been unilaterally captured by the power procedures of the extractivist apparatus. Looking anamorphically, there are possible leeways for the emergence of posthuman commons, associations and coalitions between humans and rocks. However, on the ground, those that work and live on these frontlines of extractive capitalism live under perpetual threat if not blackmail of financial dependency. The havoc and pain caused by extraction is here to stay, inscribed on the bodies of decapitated hills and on human bodies. This is a time for metamorphosis of hearts, minds, technologies, worlding projects. The performance, deep down and under, was an act of re-imagination of extractive industry from something that only takes from the earth, into a reproductive affective labour, a sort of earthculture, cultivation of the earth. It should be readily noted that, agriculture, from its inception implied appropriation of land and biopower, and in that sense it fully participated in the anthropocene. (To this should be added the close intertwinement between metallic tools and development of agriculture.) However, i believe the two should not be equated. Agriculture on small scale, as subsistence economy, decisively opens possibilities for more just naturalcultural commonings (e.g, Mies & Shiva, 1993; Shiva, 2005; Dalla Costa 2003, 2007). Mining would benefit from learning from agriculture, especially from more sustainable practices such as permaculture. What kind of scales and collaborative practices would permaculture of minerals demand? What kind of posthuman mineral-human matterings―meanings, as well as withdrawals, would this demand? These are issues rarely discussed in sustainability literature. Viewed and analysed through posthuman standpoints, perhaps withdrawals from entire lines of technology would be seen as affirmative, and entirely different modes of entanglement would be invited. ‘Urban mining’ has become a magnet for business opportunities, but, has come under radar of media art practitioners. Some of the projects i mentioned in Part I, especially Revital Cohen & Tuur van Balen’s artificial minerals, and Jonathan Kemp, Martin Howse and Ryan Jordan’s crystal world are instances of urban mining. An estimate says that as much as 80% of copper ever mined is still in use (Copper Development Association). About 33% of today’s copper production is derived from the existing stock (International Copper Study Group, 2014: 51). My thanks goes to Gorica Tončev Vasilić, Ljubiša Aleksić and Jasmina Stanojević of the Press team of RTB Bor for their hospitality. For example, in August 2015, from the pit in Veliki Krivelj the company extracted astounding 900,000 tonnes of ore (of average 0,27% concentration of copper). Tailing ponds are one of the main environmental problems of mining from the point of view of other earth bodies. Ponds are always prone to leakage into their environs, which they sometimes do clamorously (as in the case of Talvivaara in Finland in 2012, or Grupo Mexico’s Buenavista leak in 2014). More often, leaks take place silently and imperceptibly over much longer durations, which represents a considerable problem for environmental justice. Some time ago, slag was considered to be waste, in these days, it is recirculated back to flotation and then to the smelter again. Take note here, since my performance will recirculate slag, but in another direction. When i was visiting the company, some parts of the complex were not operating, and talking with the workers one got very different points of view on the future of the company. The shift managers and the press team were very positive about the prospects. Yet, it is clear even to an untrained eye that some parts of the complex might be technologically obsolete. A few months before my residency started, a new smelter was installed with the promise that the sky will be as blue as before the smelter was installed. The transition period from the old to the new furnace has been bumpy, and there was a period when both the old and the new furnace were operating in parallel, which has allegedly caused intense smoke outbursts. This has incited several citizen protest gatherings. Vlachs are an indigenous ancient Latinised population, now living in East Serbia, and Romania and Bulgaria. The immediate violences of extraction gain a new perspective when one visits the Zlot Cave, where one can feel the earth’s pulsating vibrancy and its artistry. Stalactites and stalagmites can almost be seen as they grow. This approach is consonant with Jonathan Kemp’s Crystal Worlds research project, where the ethos was to liberate the metals from the constraints of the ICT capitalism, and allowing them to become crystals again. The principal difference between the works is in the site-specificity and performativity. The story is also the plot of the film that documents the site-specific performance. Architect Tomas Rau insightfully criticises the designed obsolescence model and provides an alternative view of economy in documentary film The End of Ownership (2015). Copper-sulphate or blue stone, is used in agriculture as fungicide, for correction of copper deficiency in soils and animals, etc. As a fungicide, it is often sprayed on grapes, and it protects plants from over 300 fungal diseases (Copper Development Association). This agricultural connection was the material-conceptual link that encouraged the idea that mining can be turned into a reproductive activity. Together with Dr Aleksandra Mitovski, we decided that blue stone could be used as a material link towards creating a new ore. More on this below (see 3.6.e.). The technical process of crystallisation had been developed through consultation with Dr Aleksandra Mitovski, beginning in my first visits in October 2015. Aleksandra had started performing the experiments over the following months, using the side products from the smelter at Bor. Over November and December, she cultivated a consistent population of crystallisation centres. These were mixed together with the recycled copper i brought from Niš, thus uniting copper from two different genealogical pathways together. The experiments documented in the film were thus only the moment of reunion, whereas the crystallisation has been ongoing over a longer period. This association comes from the locals who use to say that the Pit is like the nearby mountain Rtanj (1,565m) in reverse. This is clearly an exaggeration, but the conic shape of the pit does somewhat resemble the striking pyramid profile of Rtanj. Through this anecdote, something deeper emerges. Earth makes mountains, and humans are experts in dismantling them. Fascinating counterpoint to this dynamics is Agnes Denes’ bioremediation earthwork in Finland, Tree Mountain – A Living Time Capsule – 11,000 Trees, 11,000 People, 400 Years (1992-1996-), a forest mountain created on site of a disused quarry. Mining is about extracting and then deposing of waste just round the corner, once the ‘valuables’ have been taken out from the ore. Through my future visits of modern mines in Wales (1600’s – 1900’s) and Finland (1700’s), i have observed that the slag was often left lying just outside the perimeter. In contemporary mines, entire landscapes are formed by the subsequent depositions of gangue, soils of no interest for the processing. This is what is often left out from photos too impressed by the pits. RTB Bor is currently remediating the Old Pit, just across from where i was performing my little rock planting. The plan is to fill the huge hole with gangue, and once the ground is back to level, to plant trees and landscape it (quite a leap of imagination to visualise this). With the current economic outlook of the company, i am afraid it might take many years before this plan is accomplished. One way or another, the machines throwing material back into the hole and me were engaged in a similar line of business, with one crucial difference. The pit is remediated with what is considered waste from the process, while i was putting back so to say ‘valuable’ copper-enriched crystal-slag rocks.